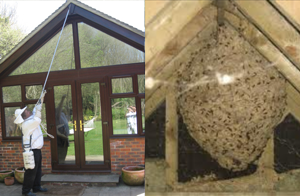 First wasp nest removal just £45.00 and £12.50 for each additional nest. We cover Guildford, Godalming, Liphook, Cranleigh, Haslemere, Farnham, Woking, Weybridge, Epsom, Dorking & Hampshire, Surrey & Sussex area. Welcome to Any Pest Control services, Any Pest Control is a Guildford based company covering the whole of Surrey, Sussex and Hampshire removing unwanted pests for domestic and commercial customers. Any Pest can help you with all your invading pests taking a professional approach using only fully qualified technicians trained by the British Pest Control Association (BPCA). All our technicians are insured and have many years of experience removing unwanted pests from both domestic, commercial and industrial premises safely and humanly. 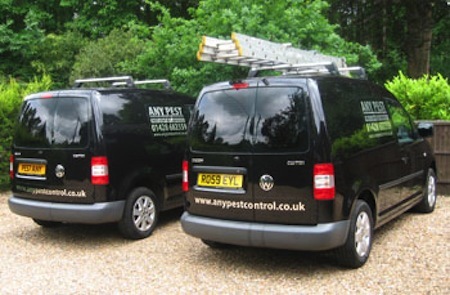 We specialise in all pest & vermin control and prevention working closely with our loyal customers dealing with all pests and vermin in a discreet, professional manner. Any Pest can help you with all your invading pests whatever your situation, from simple pest problems to ongoing and returning vermin and pests. We are able to provide an efficient, long term and discreet solution, and we offer. House and building proofing, preventing access to vermin such as rats, mice, squirrels and birds preventing costly damage. Clearing invading pests in lofts and outbuildings removing wasps, birds and rodent nests to prevent damage to property. We supply, fit and repair fly screens and electric fly-killing units of all types and manage and maintain their upkeep. Registered firearms certificate holder is available for fox, rabbit and deer control for farms, rural and urban areas. Covering the areas of Guildford, Godalming, Liphook, Cranleigh, Haslemere, Farnham and Woking, as well as the wider Hampshire, Surrey & Sussex area. Copyright © 2011 Apogee. All rights reserved.